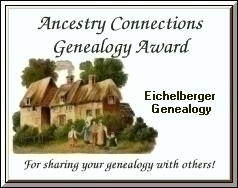 This is a repository for genealogical data on persons bearing the surname "Eichelberger" or any of its known variations ~ Eaglebarger, Eccleberger, Ecenbarger, Echelbarger, Eckelbarger, Eckelberry, Eikelberger, Eichenberger, Ekelbarger, Eiglebiger and many, many others. This site contains databases of vital records, genealogical records and much, much more! Or go right to the Name Index ~ it contains over 7500 names! Only genealogical records on this site are indexed. Those records are in the form of family group records ~ please note that many have been compiled from census records only and are unproven via primary sources. It is my goal to simply document the presence of these individuals in a given place and time in order to provide you with a starting point for your research. Thus, you should not accept this data as absolute. Enjoy your visit ~ and come back soon. New data is added often! "Remember the days of old...consider the generations long past"
Do NOT search for Eichelberger or you'll get more than 1000 hits!